Clinopodium georgianum and Lorepetalum chinense var. rubrum 'Shang-lo"
I chose these two plants because I happened to have both of them in pots. Then I wondered how I could connect them. 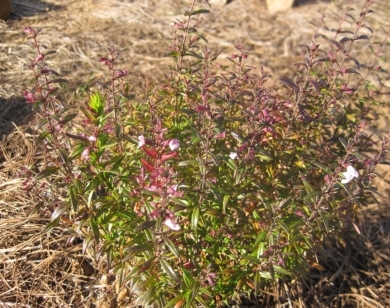 The Loropetalum is a new cultivar and I figured that the Georgia Savory or Clinopodium georgianum is probably fairly old. So I came up with the theme "Something old, something new." Next came the research to determine if Clinopodium was in fact old. Happily it turns out that not only is it old, but it is also a local plant. It was discovered by Andre Michaux, a French botanist, explorer and plant collector who is credited with introducing the Crape Myrtle, Camellia and Mimosa to North America. After spending time in New Jersey, Michaux moved to Charleston, South Carolina, in 1786 and established a garden of 111 acres just outside the city. He then began exploring the area. Although Michaux died of a tropical fever in Madagascar in 1802, he had already completed "Flora Boreali-Americana (The Flora of North America)" which was published in 1803. In this work he mentions a plant he noticed near the Savannah River and the town of Augusta and he named it Thymus carolinianus. Over the next hundred years the plant was reclassified several times, first to the genus Calamintha around 1818 and then in 1891 when all the Calamintha were changed to Clinopodium. At this point our plant was confused with another and given the species "carolinianum." In 1906 Roland Harper published an article "Some new or otherwise noteworthy plants for the coastal plain of Georgia" in which he describes the "bibliographic history" of the plant and assigns it the species "georgianum". This is now the accepted classification. So what about the plant? Well it grows in full sun, zones 7 to 9, has pinkish flowers through Summer into Fall and will grow to 18" tall and wide. It should be sheared after flowering and is evergreen to semi-evergreen in our area. Now for something new. 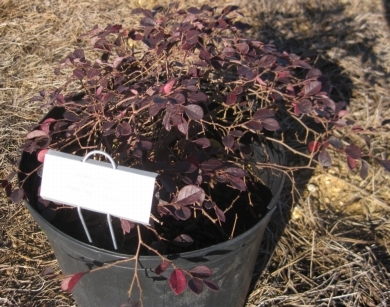 The Loropetalum is a new cultivar and has been given the name "Purple Pixie¨", the scientific name is Loropetalum chinense var. rubrum 'Shang-lo". Plant Development Services filed for a patent in July 2007. What is different about this Loropetalum is its size and growth habit. For years we have been told that each new cultivar of Loropetalum is a dwarf, only to see it reach heights of 6 to 15'. Purple Pixie¨ looks like it will be the first true dwarf available to us. It has a dense, low, spreading growth habit - almost cascading, reaching a height of 10" and width of 3' after 4 years. At maturity it can be 2' tall and 5' wide. It can take full sun to part shade, is hardy to zone 7 and has dark pink flowers. Flowering may begin as early as March and will continue sporadically through Fall.